Let Immortal Love Forever Stay. 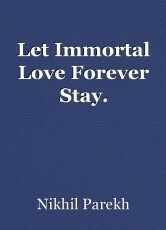 And let immortal love forever stay O! Almighty Lord; only in the unassailable beats of the invincibly palpitating and unconquerably ecstatic heart.